Here is my belated, “sort of” race report. I won’t be using too many acronyms or initialisms. You won’t be reading about my power wattage on the bike or my heart rate on the run. I won’t tell you how many milligrams of sodium I took in, or calories per hour. As I have told Peter Cummings a number of times, I’m more of a poet than a mathematician, so you number geeks may choose to stop reading now. My IMLP started as a lark. I had been doing Sprint and Oly triathlons since I retired from teaching middle school in 2008, and I had added the 70.3 distance for two races in the past couple of years. My younger tri friends (you know who you are!) kept asking when I would do a Full IM, and I always laughed and replied, “When I turn 60.” So, keeping to my word, I entered IMLP to celebrate this milestone. I remember standing in the registration line the day after IMLP in 2012 with Joe Grey, Joe Rosati, Aubrey Duquin, Jon Bottoms, and Jen Astalos, to name just a few. David Welby was there, looking for a ride back to Buffalo, wishing he had the big bucks to fork over for the race. BTC folks were all abuzz about 2013, and I was a nervous wreck. What was I thinking, entering something this difficult? Training for this endeavor took over my life during the year leading up to the race. Although I love winter sports, I didn’t ski or skate that year, worried that I might get injured. Instead, I spent my weekends on the trainer, or, if it was over 35 degrees, riding outside, trying not to freeze to death. BTC friends and great sports, Joe Grey, Karen Tierney, and Colleen Regan-Kreuz often froze along with me, and Barb O’Reilly, Maureen Kemeny, Marit Ogin, and Gary Randolph joined in the fun once it warmed up a bit. Preparing for race execution was key. Everyone racing is fit at the starting line, but many of them have the wrong idea of how to approach the day. I spent my time during taper week planning my nutrition strategy, knowing how important it was to be taking in the calories, sodium, etc., that my body would need to make it through the day. I broke the race down into sections, and planned my approach. The bike became four sections: the ride out of town, the descent into Keene, the relative flats of Upper Jay and Jay, and the climb back into town, through Wilmington. I posted my goal watts for each type of terrain on my aero water bottle. I kept telling myself that the race was just another long training day, but it is catered and it has valet service. I decided to pretend I was in Downton Abbey, with servants to attend to my every whim. Keeping a relaxed attitude, I had a full seven hours’ sleep the night before the race, getting up at 4:00 and having some oatmeal, a banana, and coffee. I got to the transition area, body marking done, all bags ready to go. Uh oh! I had left my Garmin plugged in at the hotel! No watts! No run pace! Could I possibly do this “old school?” Thankfully, my daughter and son-in-law were there, with their bikes, which they jumped on, and raced several miles to the hotel to get the Garmin, delivering it to the volunteers in transition with instructions to put it into my bike gear bag. Off to the swim start. My last rehearsal swim, sans wetsuit, had been 1:14 for 2.5 miles at the “Oasis,” so I seeded myself at the back of the 1:10 group, having been told by seasoned IMLP veteran Justin Adamek that I would surely go faster with the draft and a wetsuit. My mental training was key here. At first, I stayed wide, away from the masses, with Joe Grey by my side, but I felt that I wasn’t getting the benefit of the draft, so I went in to the cable, which runs underwater with the buoys attached. Following it is the shortest distance, and, since you can see it, you don’t have to sight. Cripes! I felt like I was entered in a Mixed Martial Arts event! I was grabbed by the ankle and yanked backwards, and I was literally punched in the foot by someone who was also grabbing my leg. Instant calf cramp! Grabbed by the shoulder! Dunked underwater! Dumb me didn’t give an inch, and I kept finding myself under the buoys. First loop went pretty well since I “stayed in my box” and kept telling myself I could not control anyone else’s behavior, just my reaction to it. Like the Brits said in WWII: “Keep calm and carry on.” The second loop was a challenge, since I caught up with some of the slower swimmers who were on loop one and who pretty much blocked my way. Lots of zig zagging needed. The swim was slower than expected at 1:15, and I came out of the water bleeding as a result of the melee! Transition One: First task was to find my Garmin. Not in the bike gear bag. Not in the run bag. Not in the dry clothes bag. My personal servant, um, Volunteer, had all my bags dumped on the grass inside the tent, and we combed through it all. T1 was longer than planned. I ran down the bike racks, yelling my bib number for the bike valets, but ended up having to find my bike myself. After mounting, then coasting around the hairpin turn behind the school, I spotted my daughter who told me to look in my Bento for the Garmin. Yay! I turned it on and waited in the rain in the mountains to catch a slow satellite while we chatted roadside. Hundreds of people passed me on the first loop of the bike leg. 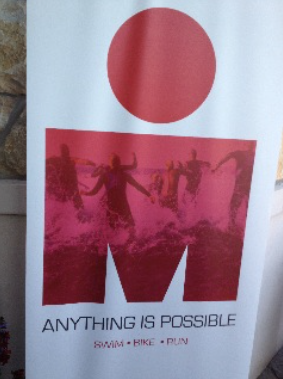 Maybe a thousand before the end, including my training partners, Joe and Gary, who I had beaten out of the water. But, undaunted, I kept my watts low on those hills. I also waited in line at port-a-potties (what the heck were those people doing in there so long?!) At bike special needs, I grabbed my treats from the bag – an almond butter and jelly sandwich and fig newtons, which I saved for an impromptu picnic at the riverside heading to Jay. I waited in another bathroom line. I know, you always hear about people peeing on the bike, but that’s not me. Being older, I needed to stretch anyway. I was out to enjoy the day, after all. So, a slooowww bike split, but feeling relaxed at the end. Transition Two: Unbelievable, but a sweet young volunteer servant raced up to me, recognized my jersey, and said she had just joined the BTC. She told me her name was Julia Taylor and she was at my service as my own personal dresser. She was amazing, even drying my feet and putting on my shoes and socks while I struggled with my other clothing changes. I had done the same for Lisa Trapasso when she conquered IMLP the previous year, and I was grateful to see a friendly face. Perfect! And, there was no line at the outhouse. So, off to the run. On the way out of town, I saw my best friend and training partner, Joe Grey, who was already heading in, completing his first loop, looking strong and confident. We stopped to share a moment of encouragement. I spotted Joe Rosati and Justin, both of whom were feeling sick, and Gary, who flashed a big grin and gave me a thumbs up. Jen Astalos was also on her way back in, looking amazing with her trademark smile and laugh. Things were going for me as planned: trot along until the aid stations, then walk a bit. Repeat. Repeat again. And again… Well, by mile something-teen, I was feeling the ill effects of the sandwich. I started drinking flat Coke. Didn’t work. My mind was going, as was my balance by mile 18. I was a bit scared, but did as planned: bring out your practiced arguments to tell your body to continue, and figure out what is needed. Sodium? The chicken broth was the answer! I convinced myself that my body was well-trained, and that I could surely finish this thing, regardless of what my brain told me. Preparing the argument with myself before race day of “that one thing” that made me want to do this was time well spent. The Buffalo Triathlon Club was out in full force, as always, on “Rich Clark Hill.” That was a godsend. Lisa Trapasso and Kara Klassasz hiked out from there to greet me near the top of ski jump hill. They gave me a much-appreciated pep talk, expressing their confidence in me. Those of you who know those two can understand that I had to keep running after that! The cheering mob of BTC’ers lifted me up the final climb. As I took my last turn onto Mirror Lake Drive, my daughter hopped the barricade, ran up alongside me, and announced, “No pressure, Mom, but the last computer update has you in the lead by less than a second!” What?! Someone had told me earlier that I was gaining on the leader of my age group, but it was all just a blur. I was going for the finish, not the win. As I ran down the hill by the Pub, I could hear Mike Reilly’s voice getting louder and louder. Goosebumps! As I raced into the Oval, I spotted training partners Barb and Maureen, tears streaming down their faces, yelling with excitement. Thousands of people thronged the finish area. 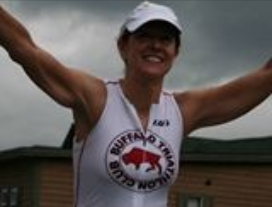 Mike Reilly’s voice was saying, “60 years young and completing her first Ironman… Kate Leary from Buffalo, NY, YOU ARE AN IRONMAN! !” I was alone in the chute, and the crowd went wild. It was a moment I will never forget! Many BTC’ers were at the finish line. Joe and Gary, having finished earlier, were waiting for me behind the scenes. Friends were at the fence, yelling, “You won!” I didn’t believe them, saying that it was a rolling swim start, and who knows where the other ladies had started. Sure, I was first to cross the finish line, but they may have started much later than me. So, off I went to get a massage. 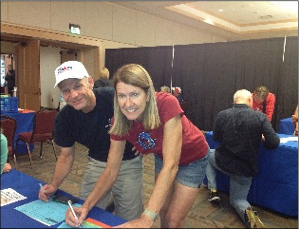 By the time that was done, the next few ladies had finished, and it was official: I was going to KONA for the World Championships! I had learned many lessons. My 2011 epiphany of always going out for an enjoyable day, not a podium spot, put me in good stead when facing an incredible challenge like this one. Staying “in my box” for the swim, keeping my wits about me, helped immensely. Patience and self-discipline on a 112 mile mountainous bike leg was crucial. On the run leg, just trotting along trumps walking, and I could do that since I hadn’t burned up my legs by pushing too hard on the bike. Over the course of the marathon, I had caught a fellow athlete who was 40 minutes ahead of me, a seasoned IMLP veteran and four time Kona finisher, because she was walking while I, known for NOT being a strong runner, could still run. The greatest lesson, however, was to always be grateful that I am truly blessed to have so many friends in the BTC. I could never have done this without their amazing support. 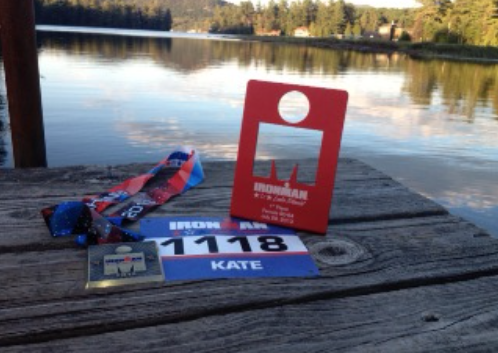 We are ALL super proud of Kate and as she says in her IMLP wrap up she qualified for Kona! Here is a small video with her crossing the finish line after her day on the Big Island! What a journey….